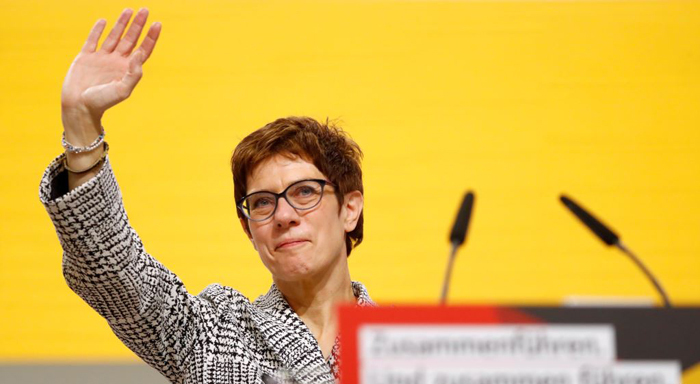 Annegret Kramp-Karrenbauer, the party's current general secretary, narrowly defeated former Merkel rival Friedrich Merz 517 to 482 at a congress of the party Friday in Hamburg. Merz sought to move the CDU further to the right. The win by the 56-year-old moderate signaled the party's preference for stability over dramatic change. Kramp-Karrenbauer is now tasked with trying to win back voters who have defected to the right and left. Kramp-Karrenbauer's win also is a much-needed victory for the legacy of Merkel, who is stepping down after 18 years as the party leader. Merkel reminded fellow party members that experience has shown "how much strength and momentum we can develop" when faced with difficulties. During her half-hour speech she received several standing ovations. Some delegates held up placards saying "Thank you, boss!" Merkel, 64, is stepping down after a series of polls have shown a decline in popularity because of her liberal refugee policy. Merkel has led Germany since 2005, and has moved the CDU steadily toward the political center.